Donna Schorr, spokeswoman for Visit Philadelphia, told a Thursday Toronto gathering that her city is steeped in American history, much of which is on display for visitors. “The U.S. started here,” she said. “Philadelphia is where the first Continental Congress convened and the place where the Declaration of Independence and UJ.S. Constitution were signed. The evening was also told by Schorr’s colleague Jenea Robinson that Philadelphia sees a large number of festivals each year and the city also has a thriving culinary scene. 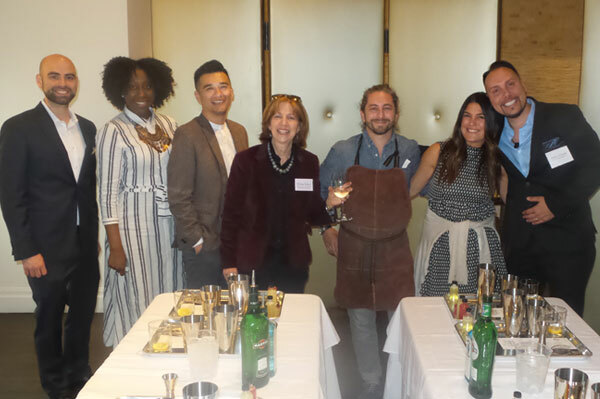 Seen here are Kevin Lessard of Visit Philadelphia; Robinson; journalist Drew Lazor; Schorr; Aaron Gordon and Christy DiMatteo of 13th Street Cocktail Catering, who were guiding their guests on making a gin-based drink last night; and Jerry Grymek of LMA, which promotes Philadelphia in this country.